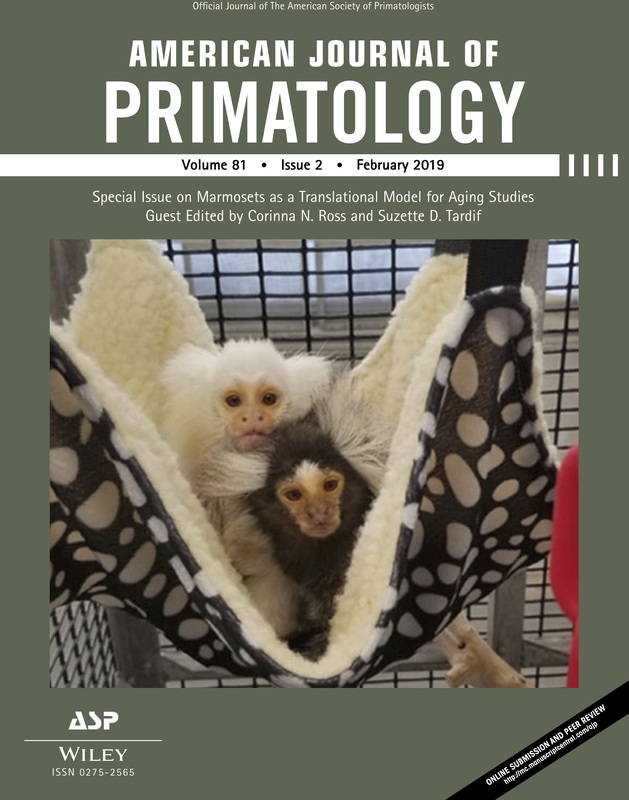 In February, the American Journal of Primatology (AJP) published a Special Issue entitled, “Marmosets as a Translational Model for Aging Studies.” The Special Issue contains a comprehensive set of studies that provides crucial new information to help guide the further development of this animal model of aging. It also emphasizes the value and necessity of nonhuman primate models of health across the lifespan. This Special Issue on marmosets as models of aging is timely, given that humans are living longer than ever before. Aging represents the single most important risk factor for the majority of chronic diseases. The CDC estimates that by 2030, the number of people over the age of 65 will double from numbers in 2000. Aging studies with rodents are limiting because the animals are too short-lived, while aging studies with primates other than marmosets are time-consuming because of their long lifespan. Studies with marmosets, which have a relatively short lifespan, are invaluable and crucial for understanding aging and for developing interventions for age-related health problems. A team of researchers led by Dr. Corinna Ross at Texas A&M University San Antonio and the Southwest National Primate Research Center (SNPRC), studied groups of marmosets at different ages on multiple measures of health. Similar to humans, geriatric marmosets were found to have significant impairments in health for each of the five domains measured: mobility, cognition, metabolism, homeostasis, and immune function. 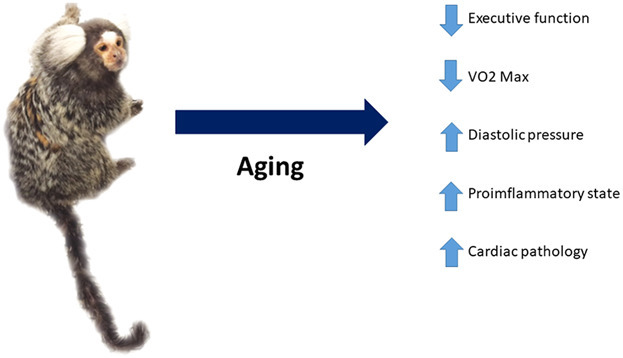 These findings characterize healthy aging in marmosets, a crucial step in the development of this translational model. If we want to know how a health condition affects an individual’s aging process, we first need to have a baseline, or a comprehensive knowledge about typical and healthy aging in the species. The profile of typical, expected, or healthy aging provides the necessary comparison for individuals affected by a condition, environmental factor, or other risk for age-related disease. Scientists at the University of Wisconsin-Madison, the Wisconsin National Primate Research Center, and the University of California Riverside studied naturally-occurring estrogen depletion in female marmosets. Estrogen depletion, such as that occurs in menopause, is a known cause of bone loss in mammals with regular ovarian cycles. However, a study led by Dr. Wendy Saltzman and colleagues found that in marmosets, low-ranking animals experience socially induced anovulation and therefore have low levels of estrogen – but they do not suffer from bone loss. This was true whether the estrogen depletion was surgically, or socially, induced. This study paves the way for scientists to identify the mechanisms that prevent estrogen depletion-related bone loss in marmosets, so as to develop new approaches to prevent such loss in humans. 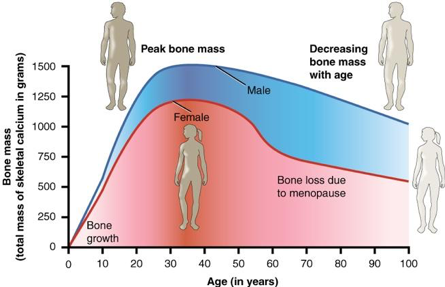 Preventing bone loss in humans is an important goal because it is associated with increased risk of injury, impairment, decreased quality of life, and high medical costs. The metabolome is the total number of small-molecule chemicals, or metabolites, within an organism. The metabolome has been studied extensively in the field of aging biology to uncover biochemical changes that cause aging. A cross-country team of researchers at the University of Alabama, Texas A&M University San Antonio, Emory University, University of Washington, and the SNPRC studied several metabolites in marmosets after the animals experienced a cross-country relocation themselves (from Massachusetts to Texas). Dr. Jessica Hoffman and colleagues found that decreases in tryptophan metabolism were a biomarker of naturally-occurring death two years after the move. They also discovered that metabolism of betaine and methionine are associated with aging regardless of where the animals were located. These findings lay the foundation for future studies of metabolism in health and longevity, and suggest potential targets for improving these outcomes. Beneficial gut bacteria. Image credit: NIH Image Gallery. 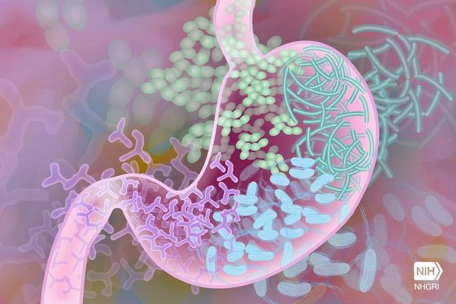 The gut microbiome is known for its role in physical and mental health, but its role in aging remains unclear. In a study to establish normative outcomes in geriatric marmosets, scientists at UT Austin, UT Health San Antonio, University of Idaho, Texas A&M University San Antonio, and SNPRC compared the gut microbiome between 10 young and 10 old marmosets. They found that geriatric marmosets had lower diversity of gut bacteria overall, but higher abundances of certain strains of bacteria. These findings mimic what occurs in humans. The research establishes a foundation for carefully-controlled studies to test microbiome-targeted therapies to improve health across the lifespan. Evidence suggests that pharmaceutical treatments can extend lifespan and improve healthy aging in laboratory organisms. 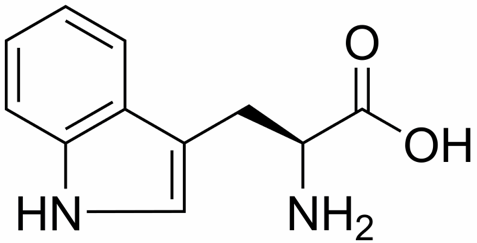 The most well-studied lifespan-enhancing drug is rapamycin, a compound that inhibits mammalian target of rapamycin (mTOR) signaling. mTOR signaling regulates cellular processes such as sensing nutrients and making proteins. Although rapamycin has been promising in rodents, they do not exhibit the same types of age-related pathologies that human and nonhuman primates do. Thus, evaluating the safety of rapamycin in a nonhuman primate model of aging is a crucial step of the preclinical process. In a study by Aubrey Sills and colleagues at the Barshop Institute for Longevity and Aging Studies in San Antonio, 9 months of daily treatment with rapamycin was deemed safe in middle-aged marmosets. Compared to control animals, neither male nor female monkeys treated with rapamycin exhibited changes in blood markers of health, and they showed no indications of potential side effects. This study is an important first step in a series of studies determining the long-term safety and benefits of a potential life-enhancing drug. Microglia are brain cells that serve as the primary immune cells of the central nervous system, protecting brain tissue from invading agents and toxic substances. 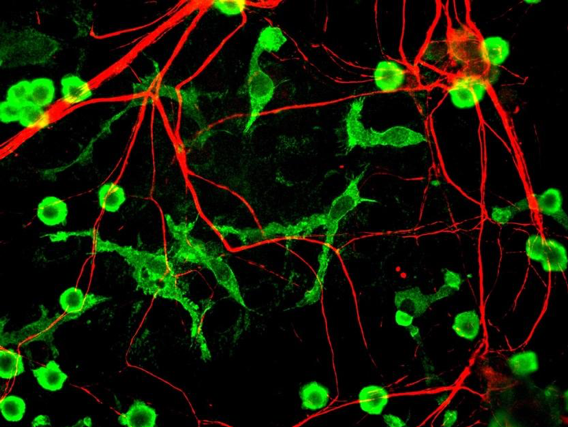 During aging, microglia become dystrophic, meaning their structure and function becomes defective, making them less able to respond to these insults. But, the causes for dystrophic microglia remain unclear. What is known is that iron accumulates in the brain during aging, and ferritin is a protein capable of storing iron. International research collaborators at the Center of Research in Advance Studies in Mexico, the Brain and Cognition Research Centre at the University of Toulouse in France, and the German Primate Center in Göttingen, Germany studied brain tissue of aging male marmosets. Rodríguez-Callejas et al. (2019) discovered that the iron/ferritin ratio is imbalanced in the brains of aged marmosets. Further, this imbalance is related to microglia dystrophy and RNA oxidation, which is associated with age-related brain pathologies. Other animals, such as rodents, may not live long enough to exhibit some of these pathologies. This research demonstrates that marmosets are positioned as an ideal animal model to study and understand the process of brain aging and neurodegeneration. 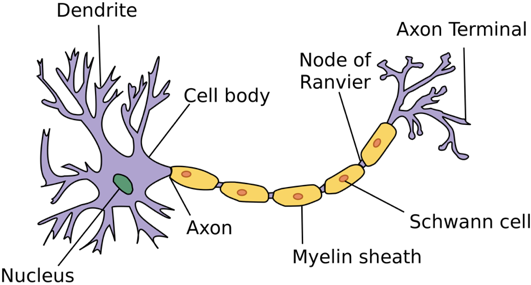 Neuron with myelin sheath. Image credit: Wikipedia (Creative Commons). Myelin is the mixture of proteins and fats that forms a white insulation around nerve cell axons, thereby increasing the speed at which electrical impulses are conducted. Measures of myelin thickness, density, and fraction of axonal fibers are good microstructural indices of white matter in the brain, which is a key factor in age-related cognitive decline. While human studies have found that these microstructural measures decline with age, it is unclear how these changes are linked to cognitive changes. Marmosets provide a unique opportunity to combine cognitive and histological assessments. A research team at multiple institutions in Texas studied age-related changes in myelin of axons and cognitive decline in six marmosets. Dr. Kimberley Phillips and colleagues found that myelin thickness, density, and myelin fraction in the corpus callosum decrease with age. Furthermore, age-related myelin changes in some areas of the corpus callosum predicted performance on an executive function task, a high-level cognitive ability. This research lays the foundation for the further study of age-related cognitive decline in marmosets, and underscores the need for studying geriatric marmosets in aging studies. In addition to cognitive decline, aging people also experience declines in fine motor function. Long-term studies of these abilities are necessary to measure the rates of age-related decline, and to understand the underlying mechanisms for the decline. Unlike rodents, which do not have hands, monkeys such as marmosets are excellent models for studying motor function and cognition across the lifespan. A team of researchers from the University of Massachusetts Amherst studied changes in these abilities over the course of one year in middle-aged marmosets. Using a standard task to assess cognitive flexibility, as well as a motor task frequently used in Parkinson’s research, Workman et al. (2018) found that female and male middle-aged marmosets showed differences in cognitive flexibility and fine motor function, and, like humans, that fine motor function declined over the year. These findings establish marmosets as a reliable model to determine the mechanisms underlying cognitive and motor abilities across the aging spectrum, even as early as middle age. Read more about other types of life-enhancing and life-saving research marmosets and other nonhuman primates contribute to, and how these special animals are cared for at the National Primate Research Centers. Posted on April 1, 2019 April 1, 2019 by EditorPosted in News, Science NewsTagged age-related, Aging, basic research, cognitive decline, gut microbiome, healthy aging, marmoset monkey, Marmosets, metabolome, monkeys, nonhuman primates, primates, translational research. Next Next post: How many cigarettes in with a bottle of wine?